We would like to take this opportunity to share with you the fascinating and intriguing history of clotheslines. For an even more detailed journey through the history of clotheslines, we highly recommend the book, For the Love of Clotheslines. 1830's | 1830 was the year that marked the first known use of the word clothesline according to Merriam-Webster. According to the same source, the definition and meaning for the word clothesline is: "a piece of rope or a wire that people hang wet clothes on to dry". It begs to question, at what point did we evolve from drying our laundry on rocks to using clotheslines? 1860's | According to an article by June Torcasio, Port Melbourne History on the Line, based on historical photographic evidence that she has examined, she has been able to conclude that Umbrella Clotheslines or Rotary Washing Lines could have been installed as early as 1860. This took place in Port Melbourne, Victoria, Australia. 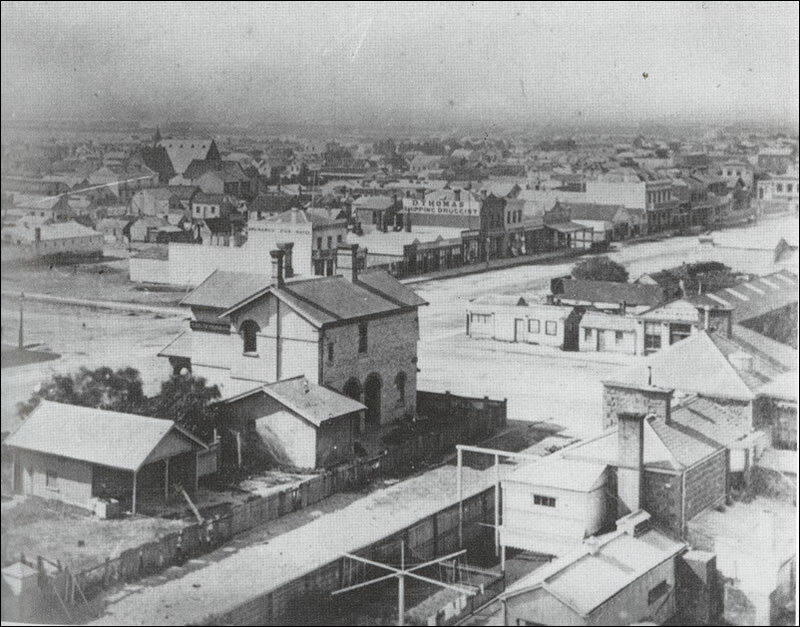 1870's | At first glance, this is a rather plain black & white photograph of Sandridge, Victoria, Australia (now Port Melbourne) taken in 1872 except if you look closer, you will see something quite remarkable. 1900's | In 1911, Gilbert Toyne, a local Geelong farrier, wheelwright, and blacksmith, first patented his Aeroplane Rotary Clothes Hoist 73 years before the Hills Hoist was developed. This took place in Melbourne, Victoria, Australia. 1940's | In 1945, Lancelot (Lance) Leonard Hill returned home from the Second World War. He found his wife Sherry struggling to hang the laundry between the overgrown trees in their backyard, so he took some old pipe, a welder and an innovative idea and created what was to become a world famous Australian Icon. The Hills Hoist was born. Word of Lance's invention quickly spread until one day, on a tram on his way to work, Lance overheard two women talking about wanting a rotary clothes hoist they had seen in a friend's yard. Lance got off the tram at the next stop, walked home and told Sherry that he was going into business to make the Hoist. Hills Industries was born. Since 1946, Hills Clotheslines have been known throughout the world for quality, durability and sustainability. This took place in Adelaide, South Australia. Today, the Hills Hoist is listed as a National Treasure by the National Library of Australia and has been featured on stamps and works of art, as the emblem of the 1996 Adelaide Festival of the Arts, and during the closing ceremony of the Sydney Olympic Games in 2000. Today, these products are known as Umbrella Clotheslines in North America and Australia or Rotary Washing Lines in Europe. Stewi Clotheslines was founded shortly after in 1947. Stewi is a Swiss company known for the highest quality clotheslines in the world. Stewi is one of only a few clothesline companies that focus entirely on clotheslines and from the very beginning they have always manufactured their high quality clotheslines in Switzerland. 1950's | Starting around the mid 1950's extruded clothesline made it's way into the market which is made of PVC that is extruded over synthetic fibers or a small wire. This presented many benefits including that it's waterproof and will not rot with extended usage making it much easier to clean than a traditional cotton clothesline. Today, we most often refer to this product as Clothesline Wire. 1980's | In 1987, Austral Clotheslines was founded in Australia and today they are the only clothesline company still manufacturing a full range of clotheslines in Australia. Notice, Austral is 2 letters short for Australia. Austral is one of only several clothesline manufacturers fully focused on clotheslines. The Austral Clotheslines are reminiscent of the original Hills Clotheslines so they are made strong and sturdy. 2017 | In January, the iconic Hills Clotheslines was acquired by Griffon Corporation, a US based company that was founded in 1959 with headquarters in New York City. The name likely wont ring-a-bell because the company operates under wholly owned subsidiaries. The company is publicly traded on the New York Stock Exchange much like Hills is publicly traded on the Australian Stock Exchange (ASX) so it's interesting that this trade happened between two publicly traded companies. The acquisition received lots of press, given the long and storied history of Hills Clotheslines, a beloved Australian Landmark being acquired by a US company. This sale happened after a failed partnership between Hills and Woolworths that was signed in December 2014 giving Woolworths control of manufacturing and selling Hills Clotheslines. The reason for the failed partnership was due to Woolworths closing all of it's Masters hardware chains which accounted for most of the Hills sales. Hills decided to sell because they have transformed from a old world manufacturer to an up and coming technology company specializing in security systems, healthcare tech, and audiovisual so clotheslines didn't exactly fit in their new product range. Click here to learn why we Discontinued selling Hill's Clotheslines!